Growing up in Mingo County, W. Va., along the border with Kentucky, my early exposure to double-action revolvers was considerable. That area was the site of the infamous Hatfield/McCoy feud and the extremely violent Coal Mine/Union Wars of the 1920’s. My own coal-mining grandfather was never without Smith & Wesson handguns of one sort or another, and it seemed that if I talked to a man who owned a revolver in those days it was also a Smith & Wesson. By the time I was old enough and learned enough to discern the different models of revolver, I could see the handgun shelves of the local pawn shops were three deep in various used Colt and Smith & Wesson double actions. To my recollection a significant percentage of those used guns were big-bore Smith & Wessons. This is an original Model 21 left, and the new Model 21-4 Thunder Ranch Revolver on right along with the special loads Black Hills Ammunition has produced for the latter gun. These are the S&W N-frame .38-44’s. Top and bottom are Outdoorsman (Model 23). In between are two Heavy Duty Model 21’s. In their first half century they came in four basic versions. Collectors today call them Hand Ejector; 1st, 2nd, 3rd and 4th Models. There have also been considerable sub-variants and nicknames such as Triplelock, Model 1917, Outdoorsman, Model 1926, Highway Patrolman, Model 1950 Military, or the newest — Thunder Ranch Revolver. 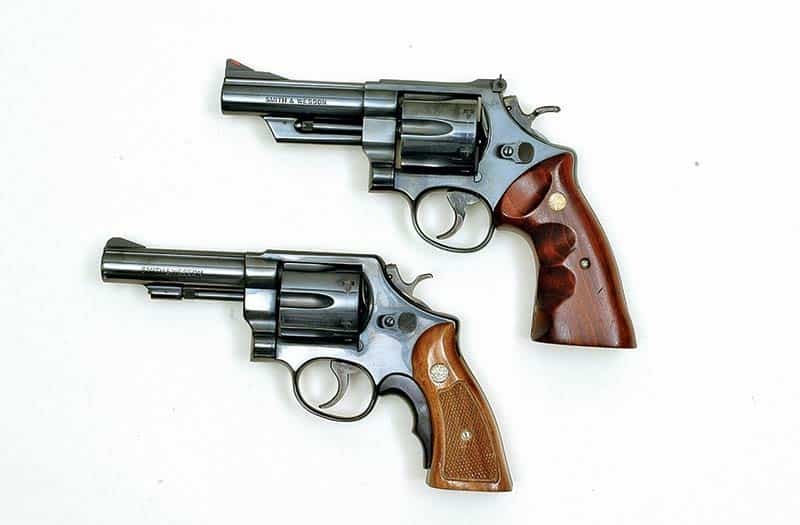 Circa 1957 Smith & Wesson began assigning model numbers instead of names to their handguns, and the N-frames took up the range from Model 20 to Model 29 and ran over into the Model 50 range. Most people mentally associate N-frame Smith & Wessons with .44’s — first the .44 Special and then the awesomely powerful .44 Magnum. However, in truth, .44’s were a minority among N-frames. Far more were produced as .45 ACP or .38/.357 caliber. And let’s not forget the many thousands made in .41 Mag since its inception in 1964. More than a handful of N-frames have been made for what could be considered odd-ball cartridges by mainstream shooters. Those would be .38-40 and .44-40. The British government bought well over 70,000 N-frames (Hand Ejector 1st & 2nd Models) chambered for their puny .455 Webley cartridge during WWI. 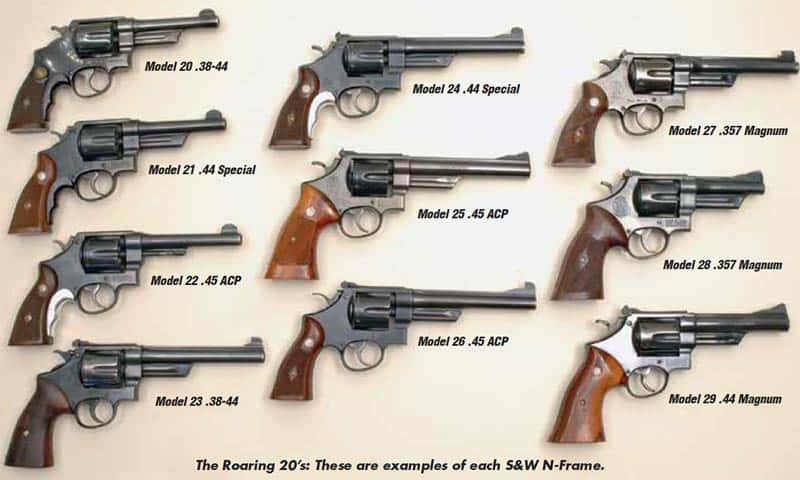 The Roaring 20’s: These are examples of each S&W N-Frame. These three Hand Ejector, 3rd Model .44 Specials are examples of the three standard barrel lengths Smith & Wesson offered on early years’ N-Frames. Smith & Wesson focused on the .44 as its premier big-bore handgun cartridge since 1870 with the introduction of their top break Model No. 3 revolver. Starting in 1872 that focus had narrowed on the fine little .44 Russian round with its .97"-long case. However, by 1907 smokeless powders were here to stay, as were revolvers whose cylinders swung to the side for loading. A side-swing revolver could be built stronger than the top-break types, and Smith & Wesson chose that time to introduce their first big-bore, large-frame, side-swing revolver. This was the premier of the N-frame, and they called the first revolver based upon it the Model 1908 Military. Later after other models were built it came to be known as the Hand Ejector, 1st Model, and almost every avid shooter has heard its famous nickname of “Triplelock.” It is a legend among revolver fans. They certainly were beautifully made firearms. If you run across one in nice shape, take a look at yourself in its blue. They were polished that nicely. The “Triplelock” moniker came from the unique third lock the company put on the revolver’s crane, and removed in 1915 as unnecessary. It was. The Hand Ejector, 2nd Model shot just as good as the “Triplelock,” just as strong and cost an amazing $2 less when introduced ($19 as opposed to $21). Smith & Wesson didn’t have much truck with the popular .45 Colt cartridge through the golden era. Along the way some N-frames were so chambered, Triplelocks and some Model 1950’s, but not many. In the 1970’s S&W started building the Model 25-5. More about that one shortly. Some handgun fans didn’t like the removal of the barrel underlug and prevailed on Smith & Wesson to put it back. That revolver is called Hand Ejector, 3rd Model, but is also known as the Model 1926. It evolved into the Model 1950 Military, which was identical in form but contained some internal engineering changes. It then became the Model 21 and, in 2004, was returned to us as the Model 21-4 aka Thunder Ranch Revolver thanks to the efforts of Clint Smith. The .38-44 cartridge (left) was a high-pressure version of the .38 Special meant only for shooting in guns built on .44 size frames. It was the forerunner of the .357 Magnum. N-Frame Smith & Wessons have been chambered for these cartridges (from left) the .38 Special, .357 Magnum, .38 WCF, .41 Magnum, .44 Special, .44-40, .44 Magnum, .45 ACP, .455 Webley, and .45 Colt. They could also chamber such rounds as the .38 Long Colt in .38 Special/.357 Magnums or .44 Russians in .44 Special/.44 Magnums but were not specifically chambered for such cartridges. One little known fact is Smith & Wesson always offered a target version of the Hand Ejector .44 Specials along with the standard fixed-sight ones. Sometimes these were very rare. For instance, a target-sighted “Triplelock” is not too uncommon. I’ve owned one myself for nearly 20 years. But, as avid as I am about N-frame Smith & Wessons, and as many gun shows I’ve attended around the country, I’ve still never seen a target-sighted Hand Ejector 2nd or 3rd Model. By the Hand Ejector 4th Model the company gave the target version its own name of Model 1950 Target and for once it sold in greater numbers than the fixed-sight version (5,050 to 1,200 in a 16-year period). It became the Model 24, and was returned in the 1980’s with even a snubnose version sold by the big distributor Lew Horton. Those are nifty little N-frames, which definitely seems like a contradiction in terms considering the N-frame’s size. Since small-frame handguns are obviously strong enough to accommodate the .38 Special cartridge, it may seem odd to the uninitiated why Smith & Wesson chose to make N-frames in .38 Special. There was a method to their madness. In 1930 it was decided to increase the .38 Special’s power — and hence its pressures — dramatically. The new round was called the .38-44, meaning it was a .38 caliber meant to be used in .44-size handguns. Factory ammunition for it was even headstamped “.38-44” so knowledgeable shooters would not fire such rounds in smaller, weaker handguns. Smith & Wesson named the first fixed-sight .38-44’s “Heavy Duty.” Within a couple of years, public demand called for a target version and they named it the Outdoorsman. Eventually they became the Model 20 and 23 respectively. 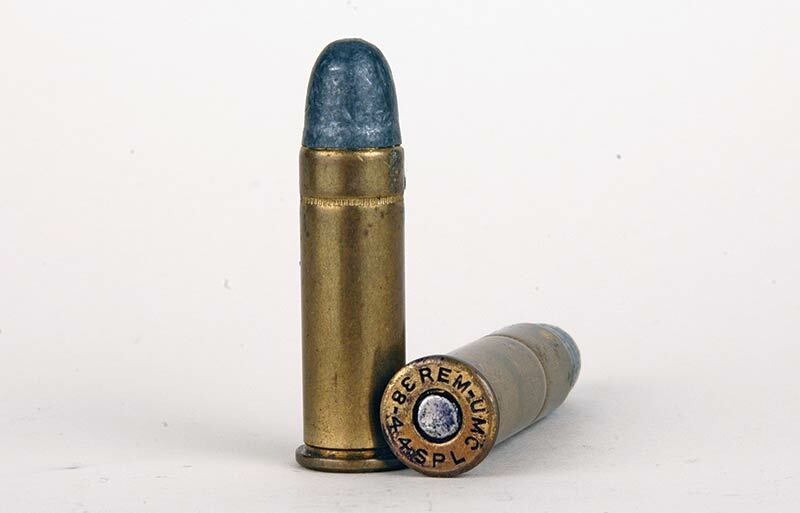 Where ballistics of a standard .38 Special cartridge called for a 158-grain roundnose bullet at about 850 fps, the powerful .38-44 had the same bullet moving at about 1,150 fps. That still didn’t satisfy everyone, so in 1935 Smith & Wesson launched the magnum era. They lengthened the .38 Special case from 1.16" to 1.29" and beefed up the N-frame with heat treatment techniques, and so were able to push 158-grain bullets up to 1,500 fps. 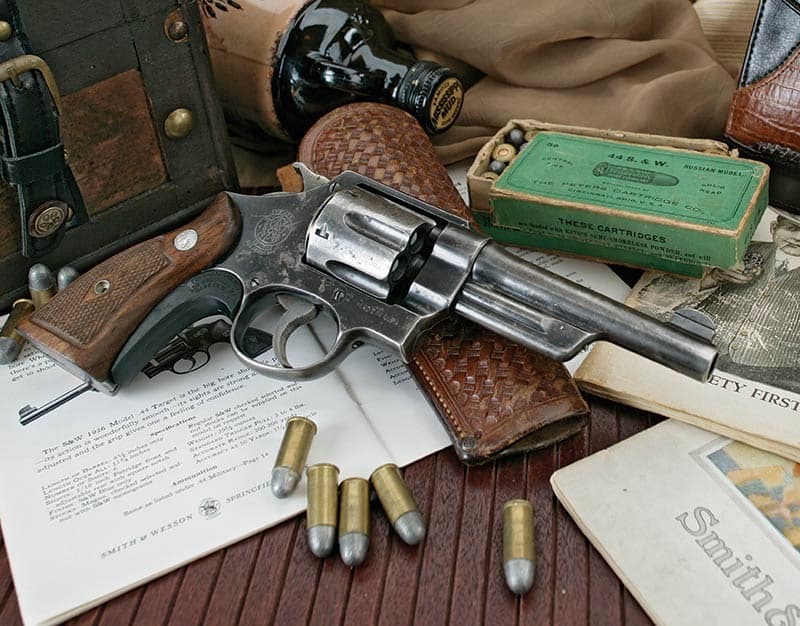 From 1935 to 1939 Smith & Wesson offered their “.357 Magnums” in a registered version, which meant they came from the factory with paperwork showing they had been ordered by and shipped to specific individuals. I have one in my collection with factory letter saying that it was one ordered as a registered magnum, but in 1939 was one of the very first shipped without the registration papers after that service was discontinued by the factory. 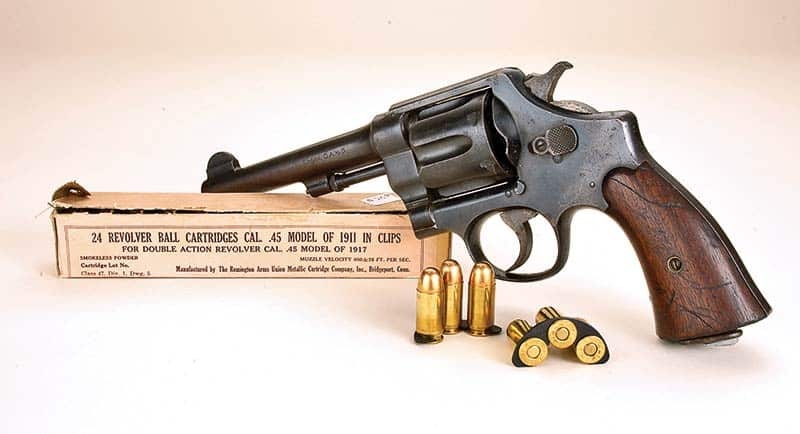 The “.357 Magnum” was a Cadillac sixgun in fit and finish, almost as good as those old “Triplelocks.” Their cost reflected such, as they were priced at $60 when other S&W N-Frames cost $35. For that reason Smith & Wesson brought out a low-cost version called the “Highway Patrolman” in the early 1950’s. In physical size it was identical to the “.357 Magnum,” but finished more to suit the working man and his pocketbook. The earlier version became the Model 27 and the latter the Model 28. Smith & Wesson saw the magnum hook landed many customers, and repeated the process again in 1955 and 1964 with .44 and .41 Magnum revolvers. Everyone knows the story of the .44 Magnum and how Elmer Keith pushed for a more powerful .44, but how it was Clint Eastwood as “Dirty Harry” who made everybody want one. At least until they fired part of a box of factory loads, and then either put the gun away in like-new condition or sold it likewise in new condition. I bought my 1956-vintage .44 Magnum in such shape along with a partial box of .44 Magnum factory loads from a Mingo County deputy sheriff in 1968. The .44 Magnum became the Model 29 and has always been made with adjustable sights, but since someone envisioned the .41 to also be a police gun, S&W made it with both fixed and target sights. There was no more room in the Model 20-somethings for .41’s so they became the Model 57 (adjustable sights) and Model 58 (fixed). Of course the N-Frame story didn’t end in 1964 with the .41 Magnum. The company makes many versions of N-Frames today. But actually the innovations with the N-Frame did end a while back. There have been variations such as the stainless steel Model 6XX-somethings or other and titanium/scandium/whatevers, but still all are variations of the same N-frame theme. The only ones that have tickled my fancy have been the various Mountain Revolvers with their lightweight 4" barrels. This unique looking revolver is a S&W Model 24 .44 Special with 3" barrel as special ordered and sold by distributor Lew Horton. The only N-Frames to end up in the Model 50 series were the .41 Magnum Models 57 (top) and 58 (bottom). Now I want to tell you my take on N-Frames since my shooting collection holds at least one sample of every basic model made between 1908 and 1964. First let’s cover the .44 Specials. Everyone talks of the Special’s accuracy reputation. In my opinion it isn’t that special. From shooting results of many N-Frame .44 Specials of 1st, 2nd, 3rd, and 4th Model versions, I don’t think the .44 Special is any more accurate than any other run-of-the mill handgun. Good Specials will group five shots into about 2" at 25 yards, which, of course, is more than adequate for most purposes — just not in the legendary arena. Bad ones won’t come close to that. My Model 24/Model 1950 Target certainly isn’t a target grade revolver. It will barely group five shots into 3" at 25 yards, and I can’t find a single thing wrong with it mechanically. My attitude changes with the new S&W Model 21-4 Thunder Ranch Revolver. It’s the most accurate .44 Special double-action revolver I’ve ever owned; capable of putting five shots into about an inch and a little more at 25 yards with some loads. The most accurate S&W N-Frames I’ve encountered have been the magnum chambered ones. A recently test-fired Model 27 .357 Magnum put 12 rounds of Federal 125-grain JHPs into an inch at 25 yards from a machine rest. My 1950’s vintage .44 Magnum is almost as accurate, and I’ve never seen a .41 Magnum Smith & Wesson that was not superbly accurate. Why? I see the good coming from a perfect mating of barrel diameters and cylinder chamber mouth diameters, i.e. no larger than a .430" chamber mouth for a .429" barrel. That certainly did not happen with those .45 Colt Model 25-5’s — at least not in the beginning. Like almost everyone else, Smith & Wesson used .451" barrels in those guns but gave them .456" chamber mouths. The ones I fired were dismally inaccurate; sometimes not grouping into 4" at 25 yards. I know for a fact, however, that country/western singer Hank Williams Jr. was instrumental in getting the situation rectified by his input through a friend at Smith & Wesson. Thank God for hillbilly singers! In my shooting I also ran into an odd situation with other S&W N-Frame .45’s. Those were a Model 1917 and a Model 1950 Army. Not long ago I decided to do a handloading project on the .45 Auto Rim (the .45 ACP given a rim for use in .45 ACP chambered handguns). Along with a Colt Model 1917 and S&W Models 25 and 26 (Models 1950 and 1955 Target respectively) those two handguns were test fired from machine rest. Neither would group under 8" or 9" with any lead bullet ammo I fed them. The other three .45 ACP/.45 AR chambered revolvers all shot one or another lead bullet load beautifully. It has been written many times that the Model 1917s were built with shallow rifling for jacketed military ball ammo. I intend to delve into this project deeper with jacketed bullets and will let you know what I discover. Likewise is true with my Hand Ejector, 2nd Model .455 Webley that factory letters to the Canadian Government in 1916 for use in World War I. With Fiocchi factory loads and my own handloads using a cast RCBS bullet (260-grain hollowbase), it groups around 3" to 4" at 25 yards. And finally for pure joy of just shooting an excellent handgun nothing can beat the S&W Heavy Duty or Outdoorsman (Models 20 & 23). Shot with mild-mannered .38 Special loads these fairly heavy guns hardly have recoil or muzzle blast. In fact the last time I participated in a Thunder Ranch Revolver class, when the .44 Specials began wearing on my hands near the end of a full day’s shooting, I’d dig out the .38-44’s to finish the day. They are just plain comfortable. And one last point before I finish up. Remember how I said West Virginia had plenty of big-bore Smith & Wessons floating around when I was young? I’ve factory lettered all of those in my collection and was pleased to find that my Hand Ejector, 2nd Model .44 Special went to Charleston, W. Va., in 1929 and my .44 Magnum lettered to Bluefield, W. Va., in 1957. It’s not so easy to just go out and find good N-Frame Smith & Wesson revolvers anymore. It seems that those who have them are loathe to sell them. But, that doesn’t mean you should despair. The hierarchy of Smith & Wesson nowadays seems to be listening. They brought out those fine S&W Mountain Revolvers, then brought back the .44 Special in the Thunder Ranch Revolver for 2004. I think many of you will like what is coming next. The US Government also bought many S&W Hand Ejector, 2nd Models chambered for .45 ACP loaded via “half moon” clips and used them extensively in both World Wars. 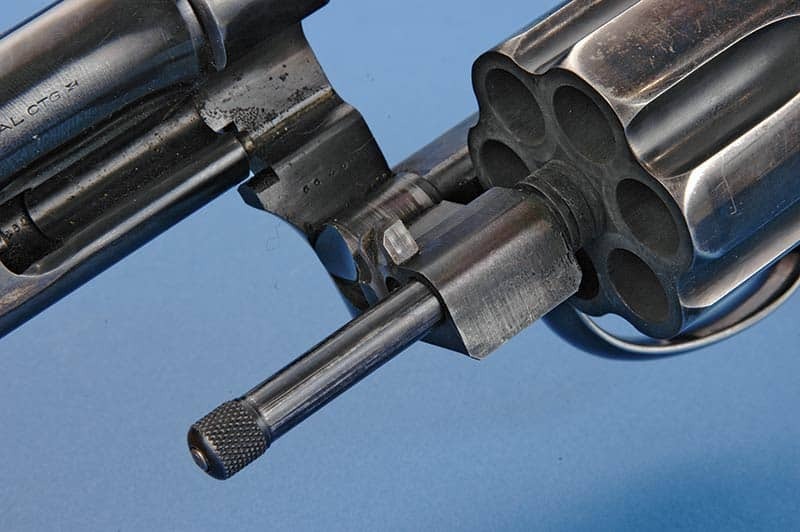 During WWI, the British — forever short of firearms — bought a number of “Triplelocks” chambered for the .455 cartridge and right away thought the large under lug encasing the ejector rod and third lock was not needed, especially in the mud of the trenches. Both changes were incorporated in the Second Model. The American government got involved in 1917 and also needed revolvers, but wanted ones firing the standard rimless .45 ACP cartridge. How does one go about getting rimless cases to extract from a star-type extraction system of a double-action revolver? Someone at S&W had the ingenious idea of making little spring-steel clips holding three rounds each, and the American government reciprocated the favor by buying over 150,000 Hand Ejector, 2nd Models, which they termed the Model 1917. In fact the “half-moon” clip idea was so good the S&W Model 1917 sold very well for 33 years. It was remodeled as the Model 1950 Army and then seven years later named the Model 22. By the time you read this you will be hearing more about the Model 22, as Smith & Wesson has the one from my personal collection there at the factory for reasons you will soon be reading about.